Another in the series of our blogs that takes a look at the history of raising money for The Children’s Society’s.The following article – written by one of our volunteers, Rod Cooper – is the second of two articles focusing on the local fundraising efforts undertaken within a local branch – namely, the Liverpool Branch – of the Waifs and Strays Society in the early years of the twentieth century. In particular, the article looks at the activities of a locally organised initiative – The Silver Thimble League. Founded in 1897 by Mrs George Killey – the wife of the Diocesan Chairman – the Silver Thimble League was in essence a development on the theme of Sales of Work, though on a much grander and organised scale. Established on a branch by branch basis, members of the League would prepare items for sale, primarily at a single, large-scale, event held over a number of days at a well-known, centrally based venue. In May 1905, the event was held over three days at the Hardman Street Assembly Rooms in central Liverpool. At this time, there were about 1,500 members in the League, and in planning for that year’s sale, all were implored to “kindly work very hard [. . .] as we aim at making £1,000” (Our Waifs and Strays Magazine (OWS), March 1905). This was a huge and ambitious sum – in excess of £100,000 by today’s value – and considerably more than the £833 sum achieved the year previously. Opened by the Lord Mayor of Liverpool, The Silver Thimble League sale opened on 4 May, and featured stalls representing many local branches of the Waifs and Strays Society, including those for Seaforth and District, Waterloo and Crosby, Sefton Park and Huyton and Roby, among many others. Opened on successive days by Lady Forwood and then by Mrs Fleetwood – the Lady President of the Seaforth Home Committee – the event featured a full roster of attractions for visitors, including the sale of refreshments, various competitions, and music recitals by ensembles such as the Cairngorm Orchestra and the Sefton Ladies Orchestra. Though very much the main event, there were a number of smaller sales staged by the League elsewhere and there were, for example, additional events organised at Warrington, Blundellsands and Maghull. Although hopes were high, and “the means of relieving us of our pressing financial difficulties” (OWS, April 1905), the revenues generated by The Silver Thimble League proved somewhat disappointing. After a deduction for expenses amounting to just under one hundred pounds, the amount raised for charitable purposes was just under £800; still a phenomenal amount for local fund-raising (the modern equivalent of £88,000), though short by about £60 than the sum raised in 1904: “It gives us no cause for discouragement, but rather spurs us on to see that the 1906 Sale fully compensates for any slight diminution.” (OWS, December 1905). In spite of these disappointments, the Silver Thimble League would continue to produce substantial funds for the local branch for years to come. Moreover, it proved to be such an effective model for fund-raising that a nationwide initiative – the Golden Thimble League – would be established in the 1930s. 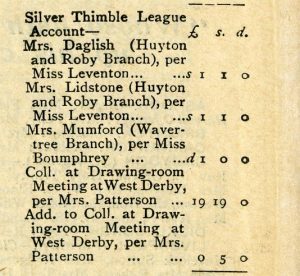 An unusual aspect of The Silver Thimble League, and one that would appear counter to centralised coordination of financial planning within the Diocese, was that its accounts at this time were operated independently from the Diocese’s own. It is difficult to speculate how this all worked out on a practical level, though it is hard to construe that this was an optimal arrangement. 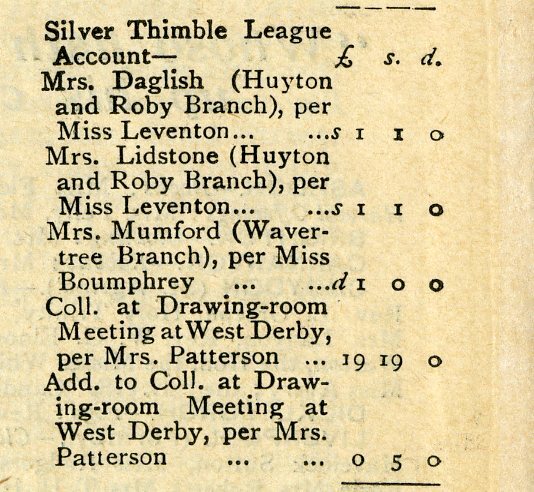 As it was, the sources from 1905/06 show The Silver Thimble League allocating funds directly to various organisations within the Diocese, including all four homes, the Bradstock Lockett Building Fund (£60), the Children’s Union (Northern Province) (£60), and the Deficit Reduction Account (£136). An amount in respect of Office Staff (£15, 5s.) was also itemised. The Society’s homes too, were a source of income. From a modern perspective this might appear somewhat controversial, and particularly so as it was one home in particular – the girls’ home at Scholfield, Wavertree – that far and away provided the most revenue. The lists of donations for this period do show a small sum (£3.25) being donated in respect of “Boys wages at St George’s Home (OWS June 1905), but this pales into insignificance when compared to the annual sum of almost £146 listed under “Laundry Receipts at Scholfield Home”. The income generated at Scholfield was regular, and though the amounts might have varied from month to month, it was clearly an established activity. Indeed, in “Notes From the North” (OWS March 1906) it is declared that, “We can do more laundry work at Scholfield Home; the work is well done and the greatest care exercised. We could do with one or two families’ work, and we can guarantee efficiency, courtesy, exactitude in return, and moderate charges. Ladies, do help us to help ourselves!” By today’s standards this might be considered exploitative, whereas at the time it would have been probably viewed as a worthy and justifiable exercise in self-help and self-sufficiency. 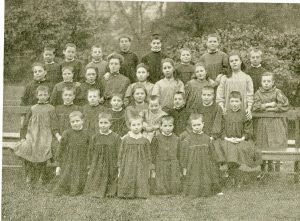 It would be misplaced too, to think that the boys at St George’s and Elm Lodge were let off relatively lightly; many children in The Society’s homes at this time were expected to undertake work within in the homes themselves, to make items for Sales of Work, and to participate in activities within their local communities. Our Waifs and Stray, December 1905, page 180 – a close up of a contribution list – showing Silver Thimble League receipts at the Schofield Home. Unfortunately, the efforts of Irene and Nellie and many hundreds of other donors and supporters were not nearly splendid enough. As the Liverpool Branch entered the New Year, the Committee were indeed optimistic towards the future: “With the close of the year we have reason to think, with feelings of deep gratitude, that our income has covered the cost of maintaining our four Diocesan Homes and our boarded-out children, in all a family of about 200; and possibly, we venture to hope, when the balance is struck, we may have been fortunate enough to reduce, in however small a degree, the accumulated deficit, which has pressed so heavily upon us.” (OWS Feb 1906). Such hopes were misplaced however, and the deficit had increased to £565 19s 5d; and increase of £56, or 11% over the previous year’s figure – a significant increase and an accumulated debt equivalent to £63,000 at today’s value. With the passing of time, the level of financial detail reported in Our Waifs and Strays for the Liverpool Diocese diminished, and it is noticeable that – instead of hard facts and figures – terms such as “small credit balance” and “improved financial position” become more apparent. This is not to say that the Branch became more relaxed about this state of affairs, but in as much as the incoming funds varied over the short-term, there was the guarantee of strong and local grass roots support for The Society and the Liverpool homes, and with well-directed fund-raising campaigns and the network of parishes and congregations, the Liverpool Branch could rest in the knowledge that local fund-raising would meet much of the lion’s share of the finance needed to maintain its local needs. Another in the series of our blogs – written by one of our volunteers, Rod Cooper – that takes a look at the history of raising money for The Children’s Society’s.The following article is one of two looking at the fundraising efforts made by a local branch of the Waifs and Strays Society in the early years of the twentieth century. In the early years of the twentieth century The Children’s Society, or to give it its full name at the time, the Church of England Incorporated Society for Providing Homes for Waifs and Strays, was very much a devolved organisation, mirroring and established upon an existing template of regional dioceses. Among these, one of the largest, most active and arguably most independent was the Liverpool Branch Diocese. 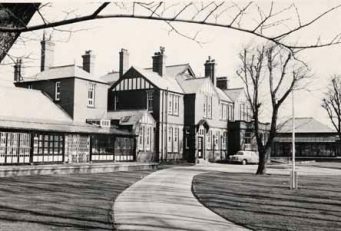 By the turn of the century, the Branch organised and oversaw the running of four homes – the Victoria Home in Formby (established for infants); St George’s Home in Warrington (boys); the Scholfield Home in Wavertree (girls) and Elm Lodge at Seaforth (boys). In addition to these, the Liverpool Diocese, through their own funds and energies – and with continued support from the Children’s Union – built and ran the Bradstock Lockett Home for disabled children at Southport. Understandably, the homes would have presented the most obvious areas of expenditure for the Branch, but it’s important to mention that boarding out – always strongly supported by the Waifs and Strays Society – necessitated considerable financial support too. Just as it is with The Children’s Society today, it was apparent to the Waifs and Strays Society that in order to be effective, it could not succeed by simply relying on good intentions. By necessity financial support, a constant flow of donations and the diligent management of funds, were essential. 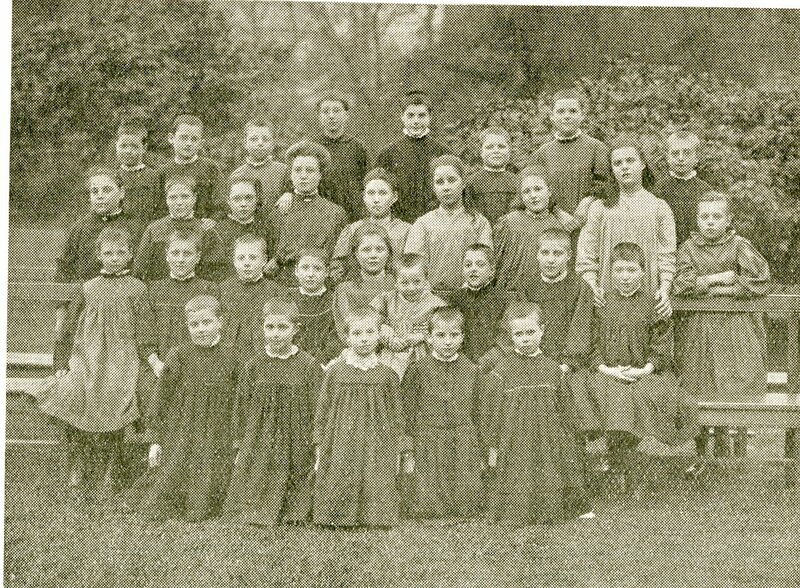 Successive copies of Our Waifs and Strays – the monthly magazine of the Waifs and Stray Society – archived at The Children’s Society’s Bermondsey-based Records Centre, illustrate some of the problems local branches had at this time. The monthly returns for donations listed in the magazine show two significant and quite related problems: widely varying monthly receipts and a reliance on numerous small and unpredictable donations. In fairness however, this latter point was something of a strength too, as it reflected the breadth and depth of The Society’s reach throughout the Church of England’s diocesan and parish network. Nonetheless, donations varied from one month to the next, and throughout the year, and this militated against efficient financial planning for much beyond the short-term. Small contributions dominate the lists of monthly donors. 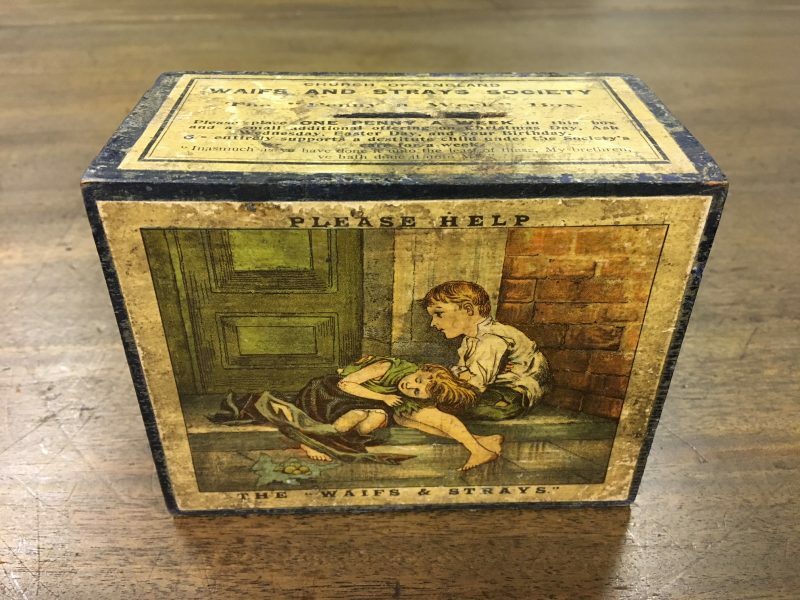 In addition to Sales of Work (typically small hand-made, hand-stitched items), small sums also accrued from numerous box collections, or from church collections – listed as “offertories” – following sermons related to the work of the Waifs and Strays Society. Boxes – literally small, wooden collection boxes – were a very popular means of raising funds, and many of these were held and returned by members of the Society, such as local branch secretaries, for example. Some, however, were positioned in local railway stations, or cafes and restaurants, where passing members of the public could donate any spare coins. 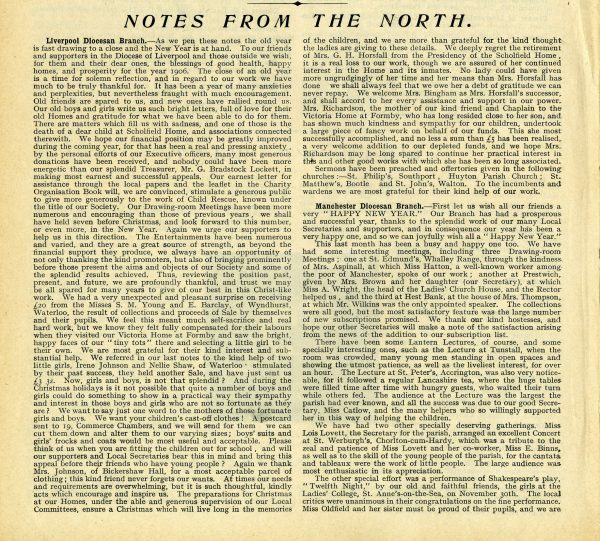 The February and March 1905 issues of Our Waifs and Strays, for example, list donations from Formby Station (the equivalent of 85 pence), Ormskirk Station (60 pence), and the Mecca Café (35 pence). The March issue also lists, among others, the Servants at Larkfield (45 pence). Entertainments of various sorts – recitals, amateur dramatics, magic lantern shows, etc. – also proved to be a popular form of fund raising. 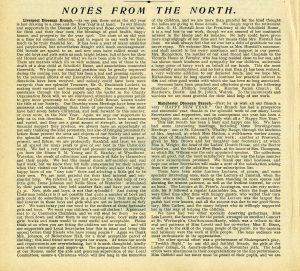 In Notes From the North (OWS, March 1905) it is reported that the Doric Amateur Dramatic Society presented two performances of “The Little Nautch Girl” at Knotty Ash village hall, whilst the Green Room Amateur Dramatic Society put on “Masks and Faces” at Sefton Park. The Green Room Amateur Dramatic Society must have proved quite a draw as the January 1906 issue of Our Waifs and Strays lists a donation of £80, 13s. 3d. – the equivalent of almost £9,000 at today’s value. At the other end of the scale, two magic lantern lectures at Bickerstaffe totalled a contribution only slightly in excess of £2 (OWS, March 1905). A less common, but nonetheless effective form of fund-raising venture was a ball. By definition almost exclusively an activity limited to the relatively wealthy and well-connected, balls had the possibility of raising relatively large funds. The Formby Ball held by Mrs Beaufort in the New Year for example, raised more than £64 for The Society (OWS, March 1905). Another form of fund-raising practised by those ‘in society’ was the Drawing Room Meeting. These tended to be held in the autumn and winter months and, almost by definition, required the resources of those with sufficient room and means to accommodate and cater for small-, or medium-sized, audiences. Moreover, to attract the appropriate audience and speakers, good connections were also necessary. 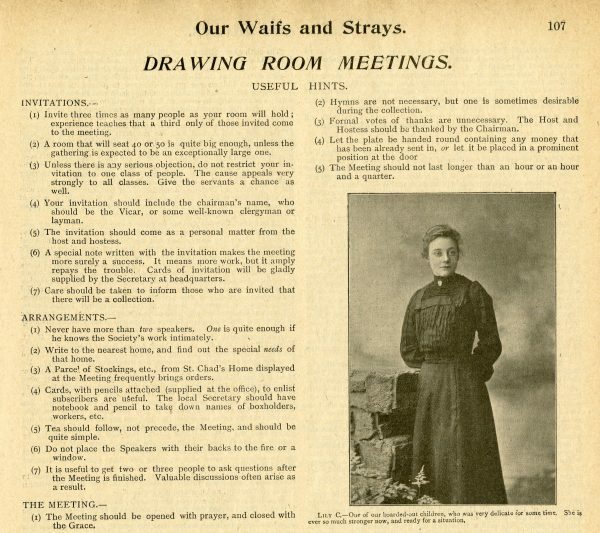 The January 1906 issue of Our Waifs and Strays, cites contributions from at least half-dozen drawing room meetings staged over the previous few weeks; including, Mrs Patterson at West Derby (£20.80), Mrs Brown at Birkdale (£4.75), and Mrs Denbigh at Blundellsands (£3.75). In total the funds raised during the month amounted to present-day equivalent of over £5,000 – simply by people making their own homes available for just a few hours, for the benefit of The Society. (1) Invite three times as many people as your room will hold; experience teaches that a third only of those invited come to the meeting. (2) A room that will seat 40 or 50 is quite big enough, unless the gathering is expected to be an exceptionally large one. (3) Unless there is any serious objection, do not restrict your invitation to one class of people. The cause appeals very strongly to all classes. Give the servants a chance as well. (1) Never have more than two speakers. One is quite enough if he [sic] knows the Society’s work intimately. (2) Hymns are not necessary, but one is sometimes desirable during the collection. (4) Let the plate be handed round containing any money that has already been sent in, or let it be placed in a prominent position at the door. Drawing Room Meetings, Boxes, Sales of Work and various forms of entertainments, would remain popular forms of fund-raising at the grassroots level for many years to come. But these were not the only means of raising funds, and in the second part of this this article a major element of the Liverpool Diocese’s fund-raising activities – The Silver Thimble League – will be looked at. Established at the local level, this initiative was so successful that by the 1930s it was established on a national scale as The Golden Thimble League.